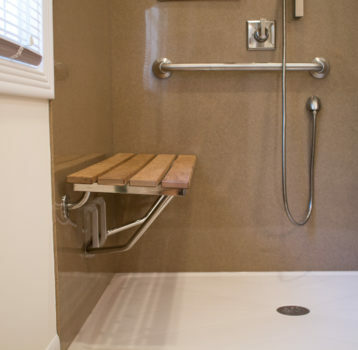 Designed specifically for roll in access, this 9' x 8' bathroom (true dimensions 8.75 x 7.5) delivers the specific accessibility needs and incredible style to match the rest of the home. Open shower space and tiled floor sloped to the drain create a wet room of sorts and avoids barriers to entry. So many things that many take for granted are not always easy for those whose mobility has been reduced. 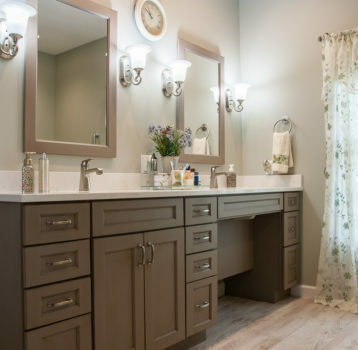 The joy of designing each and every piece of this bathroom to allow for more independence is what makes remodeling truly fulfilling. This bathroom is proof that creativity in relatively small spaces can result in HUGE improvements. - Large stylish tile on shower walls complement beautifully with glass accent tile and smaller format floor tile and add overall warmth to the room. - Niche recessed shelving in shower for both seated showering and standing showering. - Plumbing diverter and hand-held fixture allow flexibility of seated and standing showering. 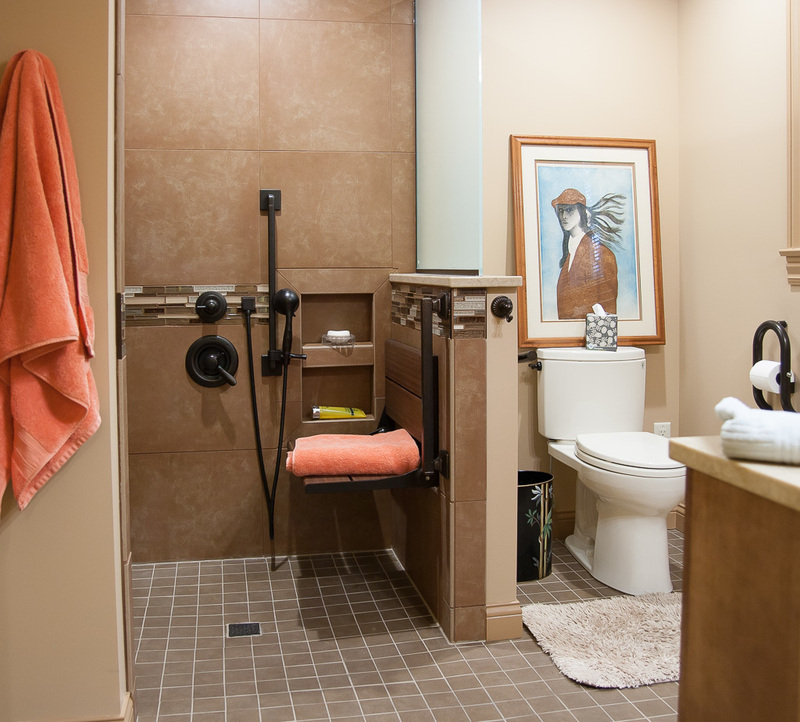 - Grab bars are functional and yet blend in with other oil rubbed bronze fixtures. - Frosted glass partitions shower to contain water spray but allows light from window through small bathroom, helping to make it feel larger. - Creative angle of short wall allows for plumbing for overhead shower spray but also creates a sense of division of shower space even while allowing full access. Cabinetry designed for both easy access of items (see tall pantry) and roll under access at sink provide the function needed for independence .